"May your stuffing be tasty. May your turkey plump. May your potatoes and gravy have nary a lump. May your yams be delicious and your pies take the prize. November is a transition month for many Northern Nevadans. It is too early to put up outdoor Christmas decorations and seasonal plant material is dormant. Porch pots are the perfect way to enhance your curb appeal and present an autumnal and winter welcome to all who come to visit. Choose your planter while keeping in mind that a larger container will have more visual appeal. Avoid using terra cotta pots since they will crack and break during the freeze thaw cycle that we experience each day. Make sure the porch pot is not so large that your guests feel they are walking through the forest to get to the front door. Live plants (ornamental kale, Alberta Spruce and other compact evergreen shrubs and ornamental grasses that have not been pruned back), pinecones, evergreen boughs, berry stems, red and yellow dogwood branches, white birch branches, pumpkins and gourds are all good choices. Look around your yard and see what you might find that would be a great addition to your porch pot. Check with the Forest Service to get a cut greens license when you get your cut Christmas tree tag. Start a new tradition of cutting greens along with your Christmas tree. Check out inspirational ideas at the Pinterest official site and type in Greenhouse Garden Center. If you have been in to see us in the last few weeks, you will have noticed big changes. We have been busy converting the interior into our annual Christmas Shop, the best in Northern Nevada. There are 26 themed Christmas trees, dramatic ceiling treatments, unique ornaments, Nativities, and seasonal decor along with many great gift ideas for holiday entertaining and the gardener who has everything! Greenhouse Garden Center invites you to our annual open house November 11 and 12, during our regular business hours. Come and join us for a festive kick-off to the holiday season. Don't forget Greenhouse Garden Center is still a fully stocked and operating plant nursery and we'll be able to service all of your gardening needs. CHRISTMAS OPEN HOUSE. MAKE A PURCHASE AND COLLECT RAFFLE TICKETS FOR A SPECIAL DRAWING ON DEC. 10. THANKSGIVING WEEKEND CHRISTMAS ORNAMENT SALE. BUY 4 CHRISTMAS ORNAMENTS AND GET THE 5TH ORNAMENT FREE! Sun scald is a real problem here in Northern Nevada, as well as in other areas of the Great Basin and the Sierras. Here's why. When a tree is dormant in the winter it can be reactivated by warm weather. We see this occurring on the southwest side of young trees, primarily from the ground up to about 3-4 feet on the trunk. The temperature required to bring a tree out of dormancy is typically just above freezing. Once active, the cells on the southwest side of the tree are unable to return to dormancy before nightfall. The freezing nighttime winter temperatures are capable of killing active cells. The damage appears as sunken or dead bark on the trunk of the tree. Then, a few years down the road the bark falls off, revealing the dead tissue in the tree's cambium layer. The tree is more vulnerable to decay organisms - potentially resulting in early death of the tree. The easiest way to prevent sunscald damage from occurring on trees (especially young trees) is to provide shade. The most common method involves wrapping the tree trunk up to the first branch. A paper tree wrap or a white plastic spiral tree wrap are good choices. The spiral wrap can be reused. Wrap the tree in late October into November and remove the wrap in March. Perhaps you have seen trees from a bygone era or in orchards with white painted trunks. This will provide the same protective effect as wrapping but may not be as aesthetically appealing. Autumn has arrived well into another year of our perpetual drought conditions. Trying to analyze the news or Google La Nina and El Nino - and it is anyone's guess if this will be the drought buster winter we have been hoping for here in Northern Nevada or if we will be entering our 6th year of extreme drought. In Great Basin high desert country, water has always been our most precious commodity. Plants in your landscape will need water at least once a month in November, December, January, and February, because our weather systems often do not provide enough water for your plants to survive and thrive. Wait to water until later in the morning or early afternoon when the temperature approaches 50 degrees F, so that the water has a better chance of being absorbed into the root system. After you are done watering, don't forget to unhook the hose from the hose bib or drain the irrigation system. There is still time to winterize your plant material and create a water-wise environment for them to get through this season. Mulch over the top of the soil and the drip irrigation system. Use shredded bark, composted leaves or other composted organic material. 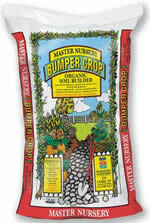 Packaged products like Black Forest Compost, Bumper Crop or Paydirt also work well and are organic. Mulching will help moderate soil temperatures, retain moisture and return nutrients back into the soil. Mulch at least 1" deep - even better, 3" to 4" deep. Keep mulch 3" to 4" away from the trunks of your trees and a few inches away from the stems of your shrubs. Your landscape may have already been a considerable investment and obviously impacts the value of your overall property including your home. It can create a positive or negative impression about who lives there. Many factors impact a plant's ability to survive a drought including the length of the drought, plant species, and how well the soil holds water and nutrients. Symptoms of drought stress include wilting, leaf drop, chlorosis, leaf margins that turn brown, stunted new growth, browning and loss of needles on conifers, twig and branch dieback and eventually death. Many woody plants can take up to three years after a drought event begins to display negative long-term effects that they may not be able to recover from. New plantings, two years old or less, are especially susceptible. Drought-stressed trees can attract insect pests and diseases including borers, bark beetles and cankers. So, when considering the value of mulching and winter watering, keep this in mind! Rabbits and deer can destroy lawns, trees and shrubs during the winter months. We have many repellents which are effective in controlling this kind of damage by making your yard less appetizing. Switch out the repellent you are using every month or so, because with time these critters become used to a repellent and it becomes less effective. Borers come into the yard at this time of year in firewood. These little creatures will live for a year in dead wood and then are able to attack freshly planted pines, spruce, cherry and other stone fruits in the spring. Removal of the bark on the firewood helps eliminate borers. It's time to apply Bonide Systemic Insect Tree And Shrub Control to ash, spiraea, snowball, dogwood and pine trees for early spring control of aphids and borers. Water all trees and shrubs one time this month. New plantings (less then 2 years old) are especially susceptible to winter damage caused by lack of water. Also, apply Cloud Cover to all broadleaf evergreens. These products are a clear, flexible polymer coating that holds moisture into the plants and reduces stress caused by temperature extremes and dry environment. They can be applied once a month in November, December, January and February. Bring in or cover your clay and concrete pots, statuary and fountains. Use a sealer to help prolong your investment. Place burlap or other absorbent fabric in the basins that can't be turned over to prevent ice from forming in cracks. Keep a concrete base (ie pavers) or a well-draining base under all concrete items. While you're at it, clean all your tools with rubbing alcohol and rub off rust with steel wool. Oil wood handles. Store your tools in a dry spot, protected from winter elements. Don't prune grapes, sugar maples or birch this month, because of bleeding sap. Only time will stop the flow, so sealing these cuts will not be effective. Prune these plants in April. Now is the time to prune 2 year old wood on raspberries for a bumper crop of berries next year. Apply Kaput Combo Bait Pellet Packs to control voles and mice. Keep extra packs on hand to replace the empties. Heavy snows can pull down arborvitaes or upright junipers, so a light pruning and/or tying with thick green tie tape will help prevent winter damage. Treat your houseplants again with Bonide Systemic Houseplant Insect Control. The insects always seem to be worse in the winter. Spray fruit trees and roses with Dormant oil (dormant insects) to kill overwintering insects, eggs and spores. Start a pot of fragrant paperwhites or an amaryllis so that they will be in their glory during the December holiday season. These also make a great hostess gift. Pre-order your Christmas tree now for delivery anytime after Thanksgiving. Don't forget to check our Christmas shop and plan to attend our Christmas Open House on November 14th and 15th. This is perfect for dipping freshly picked apples or pears into! Beat the cream cheese in a small bowl until very smooth and creamy. Spoon into a serving bowl, cover tightly and refrigerate for at least three hours.